photos, questions and more within Google's organic search results. 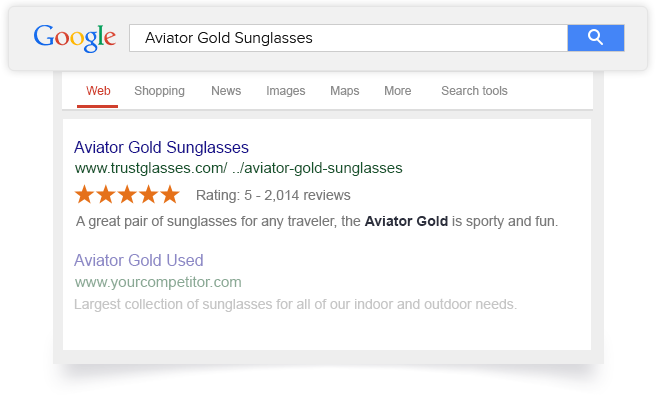 Google crawls and indexes your reviews so they show underneath your Shopify urls in organic search results. Stand out from the competition while increasing organic traffic and sales. 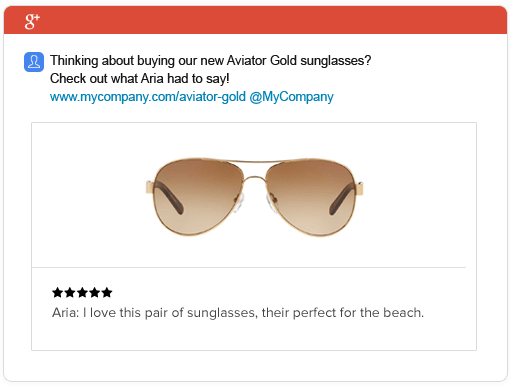 Share your happy customer reviews on Google+ with 1-click. TrustSpot will automatically pull in your customer's review photo as well. Our technology allows your reviews to load as part of your site’s overall content. This means that every review word and phrase becomes a possible search keyword to help drive more qualified traffic to your site. We observed an increase in our conversion rate of over 44%. By implementing TrustSpot, not only did we increase our profitability, but we also reduced our costs, with the number of customer support tickets related to trust issues falling by an incredible 71%. We have all been absolutely delighted with not just how TrustSpot has performed and integrated with our Woo platform but also, how all of the team are so prompt to action any queries too. Ryan and his team are excellent at responding to whatever question I throw at them. I highly recommend giving TrustSpot a spin before going with one of the others. TrustSpot is a user-generated content marketing platform that helps companies easily collect reviews, photos, Q&A, and more. User generated content helps businesses improve their on-site conversion rate, SEO, traffic, and customer retention. How much does TrustSpot cost? TrustSpot was built to be an affordable alternative to expensive review solutions. Our pricing starts at $79 per month with No Contracts, No Setup Fees, No Nonsense. Is TrustSpot for product or company reviews? Both! We offer product level reviews, company level reviews, or both at once. If you want to collect both, you can easily configure the percentage of customers who will receive product review requests versus company review requests. Can I import my existing reviews? Yes! We can easily import in all of your past reviews so you're not losing anything when moving to TrustSpot. Can you help me install TrustSpot on my store? Absolutely, we pride ourselves on helping our customers every step of the way including full implementation. Install services are included on Premium and Ultimate plans. The best way to learn more about TrustSpot is by requesting a demo. This way one of our team members can walk you through every feature we offer and answer any questions you have. We can do same day demos as well to help with your busy schedule.